Header photo: The adorable Sakhile Matshazi represents Black History Month in Iqaluit by combining Nunavut and Africa in her outfit, an Artcirq T-shirt worn with a Zimbabwean beaded necklace. Over the last three weeks, I have attended several Black History Month events here in Iqaluit, and I have been truly inspired and excited by what I saw. From free film screenings to a community showcase to an Afro-Caribbean buffet, the celebrations were not only bigger and better than last year, but also very well-attended by a wide cross-section of the town. Now in its second year, Black History Month in Iqaluit has presented itself as an established community festival, notably in a territory that alreadystruggles with a legacy of racial discrimination against another marginalized group. Or perhaps that's precisely why so many Iqalummiut received Black History Month with such acceptance and understanding. In a place where race is a subject of conversation and concern, the opportunity to recognize and condemn prejudice, collectively and productively, will likely attract a number of supporters. Of course, to draw people in, you must also have interesting and accessible activities (all the better if they're free) and someone to run said activities. 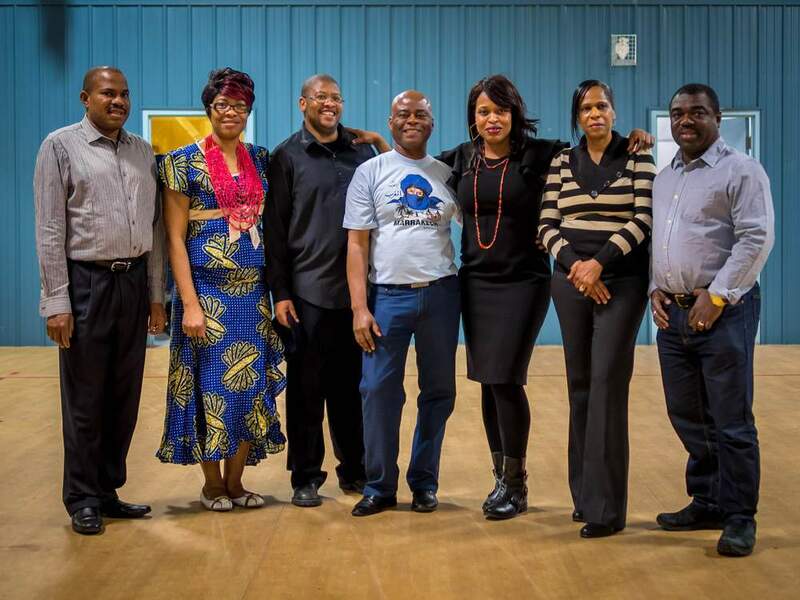 Enter the organizers behind Iqaluit Black History Month, a group of dedicated volunteers who have clearly taken this to the next level. But who are they, and why have they, this year, decided to bring Black struggles and triumphs to the forefront of the Iqaluit social scene? Keep reading to learn about the subcommittees of Iqaluit Black History Month and get a sense of the city's ethnocultural diversity. And by the way, Black History Month in Iqaluit is not over yet! 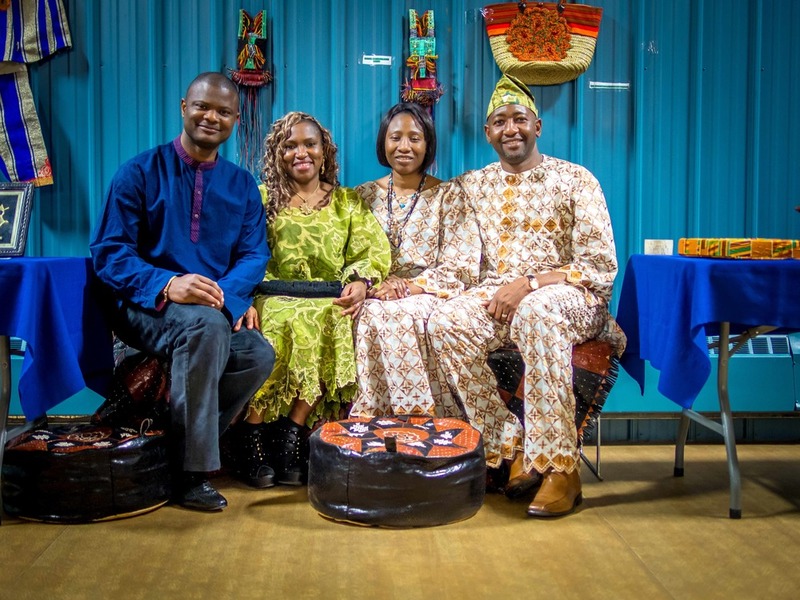 Artworks Africa will be holding an art sale at Hotel Arctic on Saturday, February 28, and the month's festivities will culminate with Jabula, a celebration of music and dance at the Royal Canadian Legion that same night. More info on these events below, or check out the Iqaluit Black History Month Facebook page. 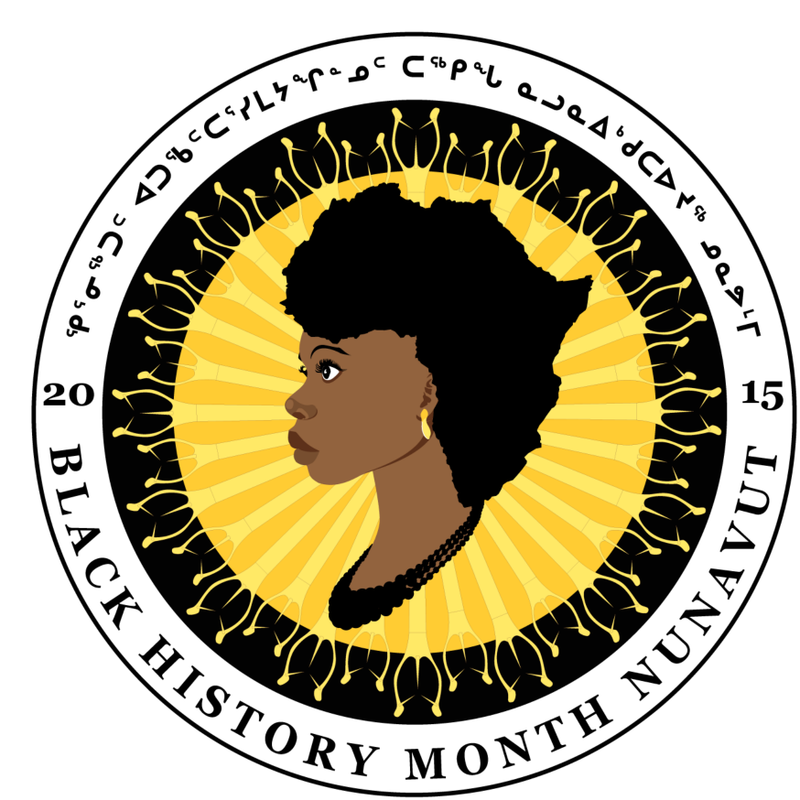 The Iqaluit Black History Month logo, designed by Lekan Thomas, combines elements from African, Nunavut, and Canadian culture. From left to right: Francis Elimimian (Nigeria); Grace Elimimian (Nigeria); Bekin Khumalo (Zimbabwe); Milton Grace (Jamaica); Stephanie Bernard (Jamaica); Gillian Lewis (Grenada); Jude Lewis (Grenada). This diverse display of Black diaspora took charge of last weekend's Variety Show. With representation from Nigeria, Ghana, Jamaica, Somalia, Zimbabwe, and Cameroon, the celebrations included musical performances, lectures, spoken word, tributes, trivia, and prizes. "It is important to not only diversify the events available for Iqalummiut to attend, but also to educate them about Black History," Stephanie Bernard says of the event. "This can only lead to a stronger more vibrant community in the short and long term." From left to right: Victor Akande (Nigeria); Teegee Akande (Nigeria); Shola Egbuna (Nigeria); Roy Egbuna (Nigeria). This Saturday, February 28, from 3:00 PM to 5:00 PM, Hotel Arctic will be transformed into a gallery and art shop. Works from various African nations will be available for sale, including work from Nigerian-born artist Shola Egbuna. "As relatively new members of the community, I feel it is important to share our culture with Iqalummiut," says Adrian Allder on the role of art in Black History Month. "That is one way to break down racial and cultural stereotypes, open dialog...and most importantly, foster a better understanding with those other races and cultures outside our own." From left to right: Adrian Allder (Barbados); Lekan Thomas (Nigeria); Cedric Rusike (Zimbabwe). This final subcommittee has been in charge of the first ever Black Film Festival in Nunavut, which included screenings of Dear White People, Selma, and Race is a Four-Letter Word. Like all the Black History Month in Iqaluit events, the film festival was open to the public and free, and proved to be quite popular - the Astro Theatre was packed for the debut of Selma. 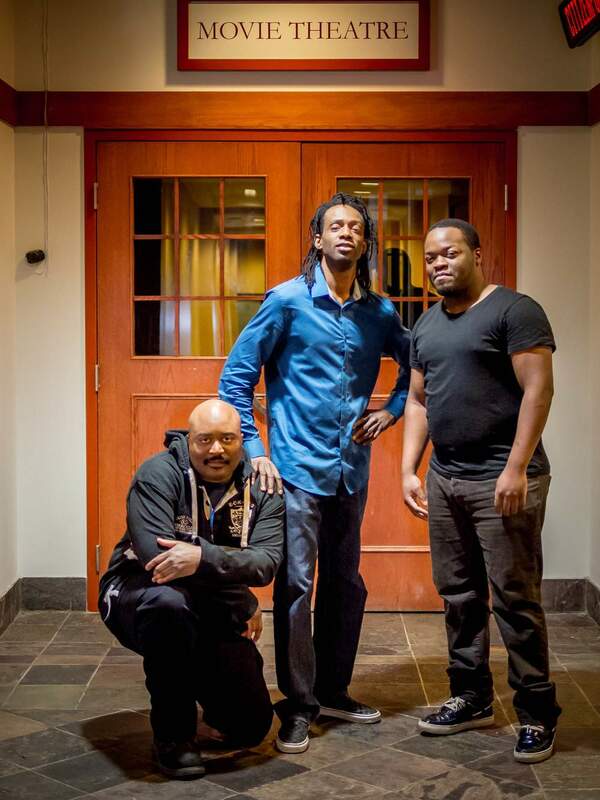 When I spoke to Adrian Allder and Lekan Thomas about writing this piece, we surmised that some of Finding True North's readers would be surprised to know that there are Black people in Iqaluit (I know many people are slightly shocked by my ethnicity as well - "What? A brown girl blogger from the Arctic? Get out!" they say). In reality, Iqaluit is home to a diverse range of ethnicities and cultures. Adrian, who has been living in Iqaluit for nearly 12 years, estimates we have over 150 people who identify as Black, representing 15-20+ nations. The 2011 National Household Survey Profile of Iqaluit counted 90 people of African origin and 35 of Carribbean origin, which doesn't even make Black Iqalummiut the largest non-Inuit, non-White ethnocultural group in town (that designation goes to those of Southeast Asian origins). All this is to say that Iqaluit has an interesting ethnocultural milieu that is affected by modern Inuit culture, ongoing immigration, and recent history. This creates the opportunity for cross-cultural connections, including reflection on the parallels between the experiences of Black people in the USA and Aboriginal people in Canada. The reach and possibility of Black History Month is summarized by Lekan, who stated, "Black History Month serves as a reminder to progress and elevate each individual, regardless of race, so that we never return to the oppression of the past." To learn more about the first interactions between Black people and Inuit, check out Kenn Harper's short write up about the word Portagee and the biography of Arctic explorer Matthew Hensen. I trust that there are many other sources about ethnic diversity and cross-cultural exchange in Nunavut, and I invite you to share any you find in the comment section or on our Faceboook page. Special thanks to Stephanie, Lekan, and Adrian for all their help with this piece, and to Anushila Shaw for her expert touch on editing my photos.